Rupert Parkes aka Photek is regarded as one of modern electronic music’s most innovative producers and DJs. We caught up with him at SXSW 2012 for a brief interview in which he discusses this early days as a rave music producer and DJ, learning about equipment and music production in magazines like Sound On Sound and Future Music, moving from Cubase to Logic Pro, using Ableton Live for for production and performance. He talks about the brand new DJ-Kicks mix/compilation for !K7 and offers some invaluable advice for up and coming producers, composition techniques, honing your craft and having a unique voice. A fixture on the UK jungle scene since the early nineties, Photek a.k.a. Rupert Parkes (born 1972, St Albans, England and associated with Ipswich in the nineties) is best known for his role in developing the “intelligent” drum & bass genre. 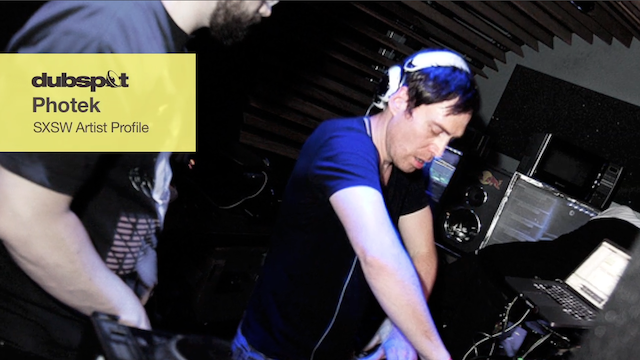 Over the course of his career as Photek, Parkes has developed a sound that is simultaneously individual, innovative and accessible, earning him much respect and popularity amongst critics and music fans alike. The strength of the sound finds foundation in Photek’s incredibly detailed drum programming, which is then augmented by his sophisticated sense for combining abstract sounds with jazz and classic techno influences. Recently Parkes has been more and more active in producing music for film, having worked on a number of scoring projects for upcoming features from his new home base in Los Angeles. His dedication to film scoring is evident, and his perfectionist attention to detail and tireless work ethic are quickly leading him to success in Hollywood.